Winnipeg lost its King of Comedy on Thursday, when Pat Riordan, 69, died of stomach cancer. In the above photo, he's second from the left in the back row. Pat was a singer with the band, the Balladeers, performing at local lounges Champs and Pierre's, and he hosted the comedy show at the Viscount Gort Hotel and the Winnipeg Press Club for some 20 years. 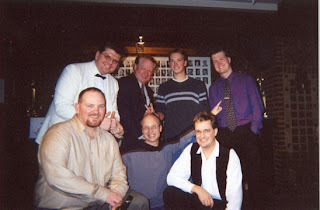 When we (Jason Beck, Trevor Boris, Charlie Oynske, and I) started our stand-up show at the Press Club just over 10 years ago, Pat couldn't have been more gracious. He was under no obligation to link himself to a bunch of crappy start-up comics, which we certainly were at the time, but he came out of retirement to host our show a number of times, including one at the British pub in Gimli, Manitoba, which I remember fondly for getting paid in pints of Guinness. Afterward, we hung out on Pat's boat, the Jennie May, which was his favorite place to be. Onstage, Pat reminded me of a Winnipeg version of Johnny Carson: he always wore a suit jacket, had a relaxed demeanor, and cracked up most when a joke bombed. When said he was going to stop doing our show, we asked him to stick around, and he said, "You guys are great; you don't need me anymore." That was maybe the first professional vote of confidence for any of us. Riordan's service will take place Thursday at 2 p.m. at the Cropo on 1442 Main Street. RIP Pat! I hung around at the Gort for a while in the late 'seventies and had the privilege of playing drunk harmonica with Pat on Waldorf Astoria Blues. I still belabour my wife with Riordan routines and will continue to do so until I become a nuisance. Pat would be proud. The best Remembrance Day album of all time? Hey, banks are broke, but they're also cool!